Can't Do What You Want? Then Do What You Can! I've spent the last 10 weeks in a knee-high moonboot due to an old ankle injury that flared up over the summer. There will likely be surgery to fix the problem in the near future and that means a couple of weeks on crutches and more endless weeks in the blasted moonboot. It's frustrating and depressing. But today I decided to quit lamenting all the things I can't do and start figuring out what I can do in spite of the boot. On weekends, I cheat a little and wear an inflatable splint inside my mud boot on the bad ankle. Under the pretext of keeping my moonboot clean for all the days I have to wear it to work, it gives me a much needed break from the halting half-limp gait the boot causes since none of my shoes are exactly the same height as the moonboot. I am very careful and do avoid uneven ground and pay close attention when I'm around the horses. With six horses it's pretty easy to get run over if you are not paying attention. But it feels so good to just to be able to walk level! This morning I decided to bring each of the horses up one at a time for a private grooming session. I ended up only bringing five of the six up. The three year old was a little fractious and I decided not to push my luck. It was nice getting to spend a little one on one time with the five that I did bring up, but it didn't really satisfy my itch for horsey time. What I was really wanting to do was ride which is out of the question right now. I ended up feeling more sorry for myself after my grooming sessions than I had been before. I just kept running down the list in my head of all the things I can't do and all the things I'm missing out on these days. But then something snapped in me. When my kids were growing up and had a sour attitude about something, I would have what I used to call a 'come to Jesus meeting' with them and then send them to their rooms to change their attitude. After 10 weeks in the boot, my attitude was definitely sour and I wasn't even liking spending time with me. So I had one of those meetings with myself and decided to change my attitude. Just because I can't ride doesn't mean I can't spend time with the horses. On weekends we sometimes put the horses up in the small front paddock to give the pasture a day or two off and the horses something new to look at. Since they were up front instead of in the big pasture, I was able to get to them without crossing any rough ground so I headed out. They noticed me when I came in the gate, they always do. Their heads come up, they stop munching for a few minutes to see if they can figure out why I'm there. My mare is particularly attached to me and has probably been feeling neglected since I have barely paid any attention to her lately. She took a step or two toward me and then waited. I walked on out to where she was spent a few minutes just scratching all the places she can't really reach. Then I stepped back and walked back the way I had come, to see if she would follow me. She did, she usually does. So I walked to the round pen and sat down on the mounting block we always have in there. She walked up next to me dropped her head to look at me for a minute ...then proceeded to nibble at the sparse grass around us. She was just out of my reach. I could have stood up and taken a step in her direction to scratch on her, but I decided to see if she would come to me. I raised both hands and made scratchy moves with my fingers. She looked at me like I'd lost my mind at first and then you could almost see the light bulb go off in her head ..'oh, you want to scratch me!' She took two steps toward me and then another and she was in range. I was able to scratch her chest and up her neck. A few minutes of that and she was ready for me to scratch her belly and finally her hind quarters. I sat on the mounting block the whole time and let her do the maneuvering. It wasn't what I wanted to be doing, but it was what I could do and it felt good. My attitude is much better now. I know it will likely be March or April before I can ride again, but I'm okay with that. I am blessed to have horses not only in my life but right out my back door. I am even more blessed to a horse that can be a pasture ornament for six months or a year and still be a good ride when I finally get back on her. Yessiree, I am truly blessed. As preppers, we all seem to be poised for one big catastrophic shi*t hits the fan scenario ...it could be a global nuclear war, or an EMP strike by North Korea, or a sudden and absolute collapse of our banking system, or perhaps martial law and imprisonment imposed against us by our own government. There are dozens of theories about what the 'beginning of the end' might entail. But maybe it isn't one big catastrophe that we should be watching for after all. Morale is essential to survival. If we allow ourselves to lose all hope, we are defeated. Allowing ourselves to become discouraged by all of the mini-catastrophes we each face would ultimately mean defeat. Just in our small circle of friends in the APN network, many of us are struggling in one area or another. Some of us have lost jobs. Others still have their jobs but have had their hours cut, and then cut again. Still others are having to make hard decisions between the little 'luxuries of life' ...such as to have or not to have electricity at all if it means the difference between being able to feed and clothe the family or not. All of these little catastrophes will take a toll on our morale ...if we allow it. The thing that gets us through any hardship in life is knowing that the hard times will pass. Most of us have been raised to believe that tomorrow is full of possibilities and that all we have to do is endure the hard times and we'll have a brighter future. But as we watch the slow steady erosion of our core principals, and the gradual decline of our individual quality of life, it gets harder and harder to maintain hope and optimism. Just as we each must face our own personal challenges, we each must also maintain our own morale. If we are to survive whatever is to come, we must keep our own hopes and ambitions alive. We must also encourage each other, lift each others spirits if we are to keep the dream of what this country once was alive. If we fail in that, all of our efforts ...all of our preps are for naught. I'm just sayin' ...recognizing the danger of discouragement is half the battle. So go on and prepare for the worst as your finances allow. But do not neglect to maintain your own morale ...always hope for best. And always be ready to encourage others to do the same. I can't quite bring myself to complain about a bread machine that only cost $14.99, but I did need to do some tweaking to improve the quality of bread I make in it. The first two loaves were made from boxed bread mixes I happened to have on hand. The first one came out good, but the crust was a little dark on the sides and bottom ...everywhere the dough was in direct contact with the pan. When I made the second loaf, I set the delay start timer with the idea I would be back in kitchen at baking time and could stop the baking process a few minutes early to see if I could thereby lighten the crust. I must have miscalculated the start of the baking time though because we got back 10 minutes before I thought the baking should have started and it was already done. Second loaf was same as the first, good but a little darker in the crust than I like. This time I made bread from scratch, using a recipe I found in the manual for the bread machine. I also 'camped out' next to the kitchen so I would be sure and be right there when the baking cycle started. According to the manual, the baking cycle lasts 40 minutes but I turned the machine off 30 minutes into that cycle. I took the bread out of the pan and let it cool on a rack. I seem to have guessed right in shortening the cycle by 10 minutes, but if it had not seemed quite done, I could have put it on a baking sheet and finished it in the oven at 350 degrees for a few minutes. Now this is what I consider a pretty color on a loaf of bread. The recipe I used to make this loaf is called Egg Bread and I am happy enough with how it turned out, I will try some of the other recipes in the manual next time. Add all ingredients to the bread pan in the order given. I have deleted the post advocating steam canning that instigated this post because I didn't want someone to happen to read that post and not read this retraction. I recently posted about the virtues of steam canning, but it has been pointed out to me that there are some potentially serious problems with the method. One of my readers was conscientious enough to enlighten me about the problems and gave me several links to back up what he was saying. After reading the links he sent me and few more that I found on my own, I find that I agree with him. The potential risks outweigh any benefits there might be with this method. So I stand corrected ...thank you AKA. I said as much in my comments on the earlier post about steam canning but in case anyone read the post but missed the comments, I wanted to clarify things here. I don't want to be responsible for someone making a costly purchase ($39 to $89 new for a steam canner) and suffering a potentially serious health problem as a result using the method. If I run across a steam canner at a garage sale or a second-hand store for $10 or less, I might still buy it simply because I like the design versatility of a lidded pot that can be used with either the pot or the lid on the burner ...what a great pot to carry camping. But for canning, I will stick with the tried and true pressure or water-bath methods. Yeoldfurt and I had a real treat today. We got to spend most of the day with fellow-preppers, SciFiChick and her DH ...great people! In spite of the fog and drizzle today, the hour and a half car trip wasn't too bad. Sci and her husband made us feel very welcome and we had a great visit. Sci has a 30-30 rifle that is very special to her as a keepsake handed down from her mother, but it had been jammed up and non-functional for quite some time. Yeoldfurt brought some tools and took a look at it for her. He was able to fix it and told Sci how to avoid the problem in the future. She was thrilled to have it functional again and Yeoldfurt was happy to be able to help. Afterward we enjoyed some grilled burgers served on Sci's famous chilibread ...what a treat! When we packed up to leave, they sent us home with the remainder of the chilibread and three pints of goodies from their garden ...pickled okra, jalapeno peppers and strawberry jam ...yum! 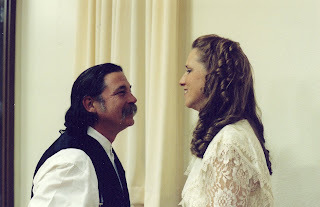 We are very blessed to have formed friendships with the likes of SciFiChick and her husband ...and so many others that we have met through the prepper networks. I encourage all of you who live close to each other to meet face to face. Part of prepping is planning for any contingency. None of us know when or where a disaster will strike, or on what scale. We need to know who our friends really are, where we can go and who we can really count on before that time comes. Nurture the bonds of friendship, work together to put a real plan in place for the good of everyone. We have encouraged SciFiChick and her husband to come to our place when that time comes and we hope they will take us up on it. If we are going to get through the hard times ahead, we are going to need alliances with like-minded folks. Today, I am experimenting with cooking one of the skinless rooster halves in the crock pot. I've cooked boneless skinless chicken pieces before, but the pieces were battered and oven-fried or stewed so they came out moist even without the skin. Today I'm making chicken and stuffing in the crockpot. I make a very simple stuffing with chopped celery and onions, a bit of garlic and lots of black pepper and plenty of chicken broth to make it moist. Melt 1 cube of butter in a large skillet. Chop four stalks of celery and dice one large onion. Mince one clove of garlic or use garlic powder to taste. Sautee the celery, onions and garlic in the melted butter until the vegetables are soft and almost translucent. Remove from heat and sprinkle with black pepper to taste. Yeoldfurt loves black pepper, so I am generous. Pour sauteed vegetables into a large mixing bowl and add your bread crumbs. I use a package of herb stuffing. If you prefer cornbread, use cornbread, or if you dry your own bread crumbs ...so much the better. Bread doesn't last around here long enough to leave many crumbs, so I buy the packaged bags of stuffing. Stir to mix bread and sauteed vegetables, then add two large cans of chicken broth. Mix well. Cut another large onion in half and place cut side down in your crock pot. Use about half of the stuffing to line the bottom of the crockpot around the onion. Lay the bird on top of the bottom layer of stuffing and put the rest of the stuffing over the top making sure you cover all the meat. I'm hoping that sandwiching the bird between the layer of stuffing on the bottom of the crock pot and another layer on top of the bird will ensure moist meat. Since I am cooking a bird that is cut in half, the onion will support the bird's shape as it softens during the cooking process. Cover and set the temperature. If I were going to be gone all day, I would set the crock pot on low and let it cook for 10-12 hours. But if there is less than 10 hours before I want to serve dinner, I like to set the crock pot on high for 1 hour, then set it down to low for the remaining time. And now, the finished product. Both chicken and stuffing are very moist. As with stuffing done in the oven, the edges got a little crusty where they touch the sides of the crock pot but not burned at all. The meat lifted out in pieces ...the leg quarter came out as one piece, the breast and wing as another. The backbone and ribs pulled out clean as a whistle, leaving the breast meat and wing intact. It's almost hard to see the meat on the platter of stuffing. The dark pieces at the edge are the crustier parts of the stuffing. Total preparation time was about 1 hour. Total cooking time was 6 hours. We won't sit down to eat for about an hour. But from what I can see and from the aroma, I believe I have to consider this experiment a success. We all know mules are sturdy work animals, known for being sure-footed, hardy and intelligent. But they're still a prey animal, right? 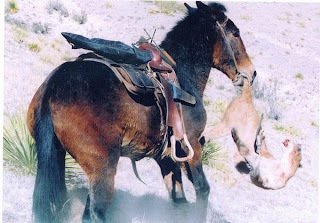 Mules are not predators. Like like most equines, their first instinct when attacked is to take flight and run away from the danger. Mountain lions, or cougars as they are known in some parts, are fearless and capable stalk-and-ambush predators capable of taking down animals as large as a horse or mule. So which do you think would prevail in a fair fight? If you put your money on the mountain lion, you'd better think again. Apparently the mule in the pictures below either felt too encumbered by the tack and trappings he was wearing to take flight or maybe he was just mad. Mad enough to stand his ground and give the big cat what-for. I don't know who to give credit to for these pictures. They came to me several years ago in an email that had been forwarded multiple times. But they are obviously not staged. That's not a 'trained' mule doing a stunt and that's no stuffed cat. Kind of impressive, huh? 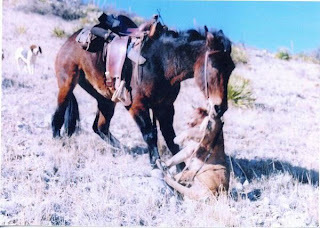 The cat was the aggressor but the mule is definitely the victor in this fight. 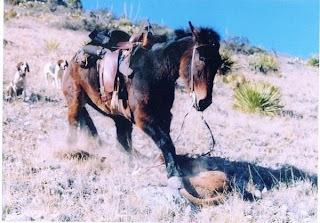 The mountain lion didn't live to take any lessons from this encounter. 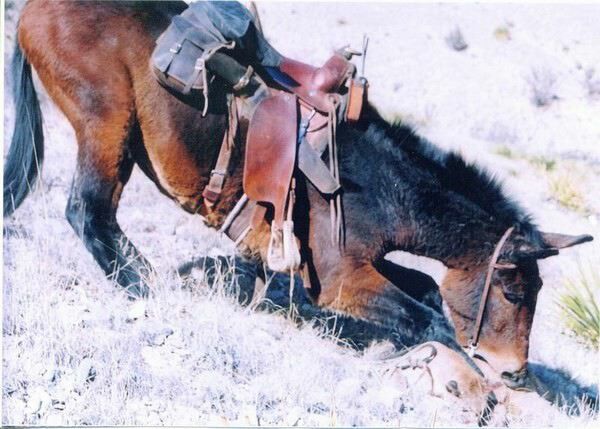 But I bet the mule learned a lot about himself and his own abilities that day. I think part of the reason there's so much frustration and tension in the ranks these days is that we have been indoctrinated with a 'can't fight city hall' mentality. We watch our taxes and unemployment go up and up. Meanwhile, our property values and wages sink to new lows. Even our most basic and fundamental freedoms are attacked and eroded on a daily basis. It's downright discouraging. But maybe we need to get mad. Really mad. Mad enough to take a stand and fight ...odds be damned. Barocky Road is a blend of half vanilla, half chocolate, and is surrounded by nuts and flakes. The vanilla portion of the mix is not openly advertised and usually denied as an ingredient. The nuts and flakes are all very bitter and hard to swallow. The cost is $100 per scoop. When purchased, it will be presented to you in a large beautiful cone. But then the ice cream is taken away and given to the person in line behind you. You are left with an empty wallet and no change, holding an empty cone with no hope of getting any ice cream. But don't you feel stimulated?!? ...Yeoldfurt and I tied the knot. 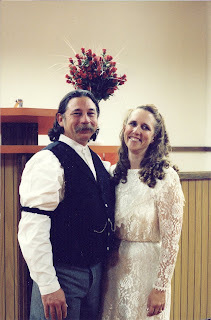 It was a simple ceremony in tiny little church in Lybrook, New Mexico. We had both traveled a long and rocky road to get to that point in our lives. But together, we made each other whole. Yeoldfurt is my husband, my lover, my soulmate and my best friend. Today, I celebrate you, Yeoldfurt! Most of us are familiar with Apple Butter, but did you know you can make 'fruit butter' from almost any tree fruit? I've used apples, peaches and apricots myself but I think Jen of New Mexico Preppers mentioned banana butter in one of her posts. I've even heard of pumpkin butter. Why not? Fruit butters are all about texture and spices, so just use your imagination. Since money is tight and the holidays are right around the corner, I will canning several jars of assorted fruit butters to give as gifts this Christmas. In my opinion, homemade makes the best gifts anyway. The following was a recipe my grandmother gave to me and that I have now passed down to my own daughter. As you can see from the title, my grandmother probably received the recipe from her own mother and it possibly dates back even more generations. What a treasure! Cook the apples in water until soft, then push through a colander until smooth. Add remained ingredients and cook in a slow oven (275 deg) for 8 hours, stirring every half hour. Seal in hot sterilized jars. Makes approximately 5 pints or 3 quarts, depending on the size of the apples. The first time I made apple butter, I used this recipe and followed the instructions exactly. But by the time I got around to making it again, I had taken a full-time job and my weekends were filled up with errands and chores. So I decided to try and adapt the recipe to a crockpot. I peeled and cored the apples and then sliced them as thinly as possible. I lightly buttered the bottom and about two inches up the sides of my crockpot to make sure nothing would stick. Then I measured all the spices and combined them with the sugar and set them aside. I started by lining the bottom of the crockpot with a single layer of apple slices and sprinkled about 1/2 cup of the sugar and spice mixture over the top of the fruit. I layered more apples on top of the first layer and sprinkled another 1/2 cup of the sugar and spice mixture over the top of that layer. I continued this process until all the apples were in the crockpot. With 8 apples, I was able to make approximately 8 layers and ended up with about 1 cup of the sugar and spice mixture left over. In a separate pan on the stove, I heated the cider and water to a boil and then removed the pan from the heat. I immediately added the remaining sugar and spice mixture, stirring constantly until it was well dissolved. I then poured the hot water and cider into the crockpot and turned it on low. I let it cook in the crockpot overnight for approximately 12 hours. I only stirred it twice while it was cooking, once after it had cooked about 8 hours and again about an hour before I decided it was ready. A crockpot produces a moister heat than an oven and the apple butter came out wonderful. My grandmother had been skeptical when I first told her I was going to modify the method of the recipe. But even she was amazed at the good results. Foraging in the Flower Beds? Did you know a lot of common garden flowers and shrubs are actually edible? I don't just mean that eating them won't make you sick either. I mean that they are actually an excellent food source. Roses hips are a good example. They are so rich in Vitamin C that they were used in Great Britain in WWII to help prevent scurvy. The rose hip is the seed pod that develops after the bloom is spent and dies off. A lot of people prune their rose bushes to remove spent blooms and thereby keep the rose hips from ever developing. Let the blooms die off and leave them on the stem. The rose hip at the base of that bloom will develop and mature over several weeks and you can harvest it. Dried rose hips can be crushed and steeped into a tea. Fresh rose hips can be pureed and added to jams, jellies or sauces. Rose petals are edible as well though they are usually only used as a fancy garnish. Rose hip tea is thought to be beneficial in treating bladder and urinary tract infections, reducing stress, eliminating trembles, strengthening the heart and ...of course, preventing scurvy! Rose hips should be harvested in the fall after the first frost. You will know they are ready when they turn bright red in color. If you have roses in your yard and want to experiment with harvesting the rose hips, you must refrain from using any pesticides or herbicides in your yard. Another common yard ornament that is also edible is the daylily. They have a sweet flavor and a crisp texture if harvested the day the flower pods begin to open, which is usually mid-spring in most parts of the country. They are best cooked and eaten they day they are harvested, but can be stored in the refrigerator for few days. If you plan to store them, harvest them with the stems attached and place them in a glass of water in the refrigerator until ready to cook. The flowers can be battered and quick-fried in hot oil for a tasty fritter. Any batter recipe will do but whole wheat flour with a little cornstarch makes a thin crisp batter that compliments the daylily's sweet flavor. They should be fried in very hot oil, with enough enough oil that the flowers float while they cook. Daylily fritters can be served hot with butter, or glazed with fresh preserves, apple butter or cinnamon as a sweet side dish. When cooked, the flower has a texture and flavor similar to sauteed onions or mushrooms but may also be eaten raw in salads. 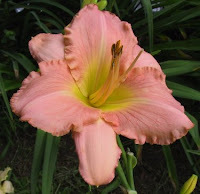 Daylilies can also be chopped and added in the last few minutes of cooking to soups or stir-fries. These flowers come in many color variations and one reason it is so popular as an ornamental plant is that it multiplies quickly... an excellent trait in a flower that doubles as a food source! Consider planting a few more rose bushes and maybe some daylilies in your yard. There is no rule that says there can't be a pretty side to prepping too!